Holiday Market and Small Business Saturday! My Inktober book is underway with a few extra bonus pages of a Day of the Dead arc. I am going to be coloring the comic but I hope to have a black and white version printed by the time Pocket Con comes around next month (more on that in a future post). 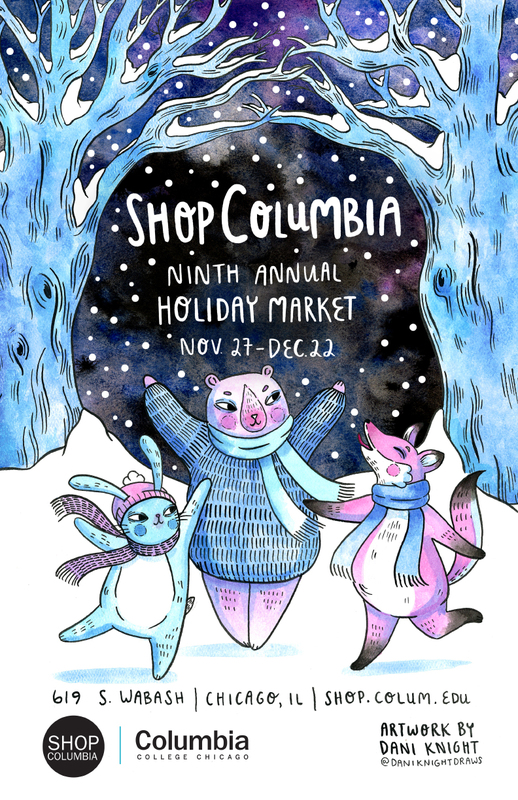 Right now, however, I want to share with you information on the Shop Columbia Holiday Market. I am going to have my holiday greeting cards available there through December. So if you are in Chicago, please make sure to go to the South Loop and stop by Shop Columbia to pick up your Holiday Greeting Cards. If you are not in Chicago but want some of these greeting cards anyway, you can now order them (and other merch!) from my online store if you click the image below! Additionally, if you are on the Northwest side of Chicago, you will also be able to find some of my merch at the North Branch Projects pop-up shop and preview sale on Small Business Saturday, November 25. Go to the former Cafe Chien on Spaulding near Lawrence on Saturday November 25 between 9 AM and 6PM. More updates soon, dear friends. Make sure you are following me on Instagram, Twitter and Facebook!